Know Your Customer (KYC) is a prerequisite for investing in mutual funds (and almost all financial instruments). It is vital compliance on the part of financial product manufacturers, to know their investor better. The Securities and Exchange Board of India (SEBI) under The Prevention of Money Laundering Act, 2002 ("PMLA") requires Mutual Fund Houses to comply with (KYC) norms, irrespective of the investment amount. However, the investors’ pace to this compliance has been slow, as not all investors have completed their KYC norms. Investors find complying with KYC burdensome and a rather complex process, involving a good amount of paperwork. And to a certain extent, this is true. To resolve this, the Government has appointed the Central Registry of Securitisation Asset Reconstruction and Security Interest of India (CERSAI) to establish a central KYC registry, which simplifies the process of complying to KYC procedures -- and you need to do it just once; either with a bank, mutual fund, or an insurance company that you’ve invested in. This means, investors/account holders don't have to fill-up the KYC form every time with other financial product manufacturers/providers. Have you complied with KYC norms? This is physically done once, of course, and you need to submit the form to your broker or investment adviser with your documents. Secondly, there is an In-Person Verified (IPV) procedure that you need to do. To do this, there’s the options of either visiting the point of sales office or fixing up an online or video meeting. But this process can prove to be time consuming and lengthy. To add on to the frustration, a lot of times these online meetings could get cancelled if either the customer service executive or the investor is unavailable. 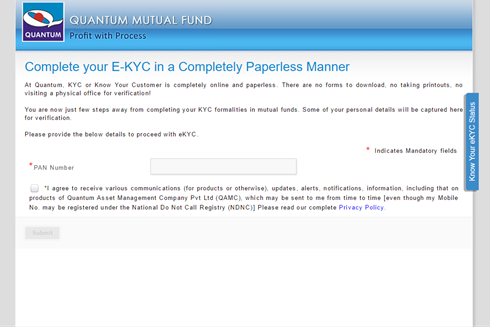 Quantum Mutual Fund has introduced E-IPV. Their E-CKYC process is completely paperless and online. And follow the 5 easy steps to become compliant in just two weeks. 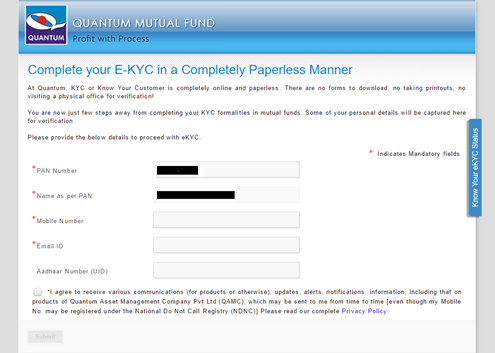 Go ekyc.quantumamc.com Enter your PAN number and it will confirm your PAN number validity. It will also check if your KYC is already verified. Next, enter your other personal details such as Mobile Number, Email, and Aadhar (UID) Number. 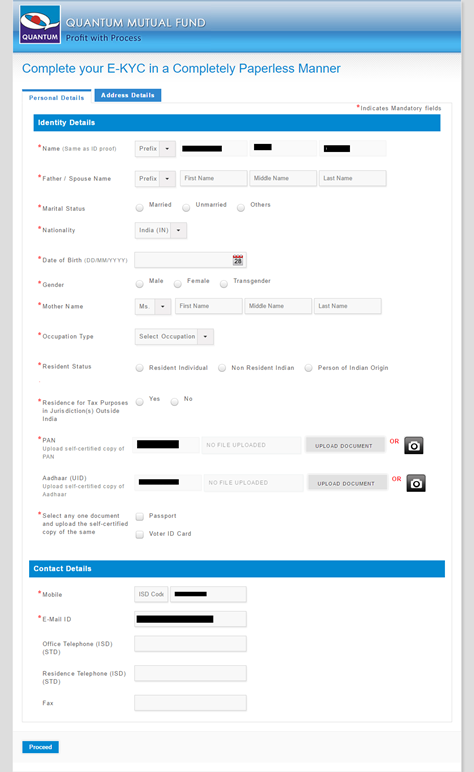 On the next page, you are required to enter further details for Central KYC purpose. Now you need to upload self-attested scanned copies of your pan card and address proof. And for the signature, you need to sign on a plain paper piece of paper and place it in front of the camera and capture it. Please note that, SEBI permits investments upto Rs 50,000 for each financial year per mutual fund for Aadhaar based e-KYC using OTP verification. Once the 50,000 limit is crossed, it requires you to undergo the in-person verification procedure. 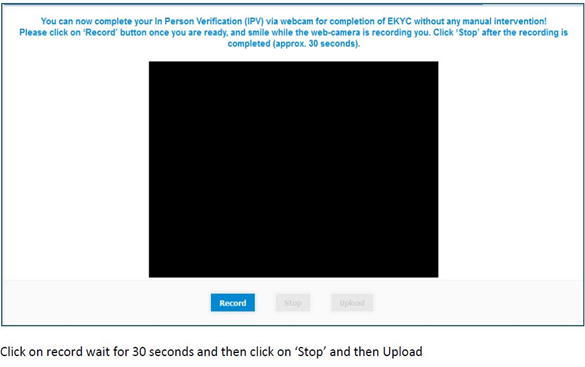 Next is your In Person Verification (IPV). Unlike the physical verification, here your live video is recorded through your device camera. Hence, there is no need for you to physically visit to prove that you are alive. Everything is possible and at your convenience 24x7. Confirm all your information and submit it. Lastly, all you need to now is wait for 2 weeks while your KYC will be uploaded on Central KYC servers and will be verified during this time period. Further, you will also get a confirmation e-mail about your KYC Status. In the mean while you will receive communication about your KYC status. You can also check your KYC status here. After the entire process is done, you will receive a 14-digit identification number- KIN (KYC Identification Number). And lastly, your FATCA declaration will also available in the same KYC form. Complying with the KYC procedure can get you started with investing in a wealth creating investment avenues such as mutual funds. You would not be expected to invest in schemes from Quantum Mutual Fund; all they’re doing is lending you a helping hand, facilitating your journey to financial freedom. Please note you might receive various communications (for products or otherwise), updates, alerts, notifications, information, including that on products of Quantum Asset Management Company Pvt Ltd (QAMC), which may be sent from time to time [even though your Mobile No may be registered under the National Do Not Call Registry (NDNC)]. I have a question?what is kyc and what need in today's life? Gud day sir, I have one doubt.how will i come to know that my ekyc is based on Pan card no or Adhar Card No. Thanx in Advance.